Magnetic flux controllers are widely used in induction heating systems for concentration, shielding or redistribution of the magnetic field which generates power in the part to be heated. Controllers, made of Soft Magnetic Composites (SMC), provide accurate heat pattern control, improve parameters of inductors and performance of the entire installation. In melting systems, especially in the case of vacuum furnaces, cold crucible and other specialty furnaces, the magnetic control can provide large energy savings, magnetic field shielding, shorter melting cycles and optimized field distribution for enhancement of the metallurgical processes. Due to the diversity of applications, service conditions of controllers are very different including very severe cases. Mechanical, magnetic, electrical, thermal and other properties must be considered in design and application of SMC. This article describes properties and performance of SMC typically used in induction heating technology. Several presented case stories are based on more than 20 years of R&D and practical experience of scientists and practitioners at Fluxtrol, Inc. Presented material may be interesting not only for induction heating community but also for all people using AC magnetic fields in technological processes. Magnetic flux control, i.e. modification of the magnetic field distribution and intensity may be accomplished by variation of shape and positioning of the induction coil turns, by insertion of the non-magnetic shields or the magnetic templates that may be all called the magnetic controllers. Each method of magnetic control has its own advantages, drawbacks and limitations. Induction coil designers pay main attention to optimisation of active conductors, their size, number and position. They try to avoid using additional components for the magnetic flux control in order to simplify design, reduce cost and possibility of the potential coil life time reduction. This approach is understandable but it is only partially correct. In today’s competitive market with new materials and technologies, more strict demands to the product quality and ergonomic requirements force us to review the existing guidelines and make corrections to the design procedure. The main tool for that is computer simulation which can predict not only the process parameters but also life time of tooling (inductors) and service properties of the final products . Different methods of magnetic flux control must be considered in the process of new system development and modification of the existing equipment. Non-magnetic controllers (shields), typically made in the form of copper rings (Faraday rings), sheets or massive copper blocks, are often called “Robber Rings”. Their use leads to increase in the coil current, reduction in the induction coil power factor and efficiency. However they may be less expensive and give good results in the case of shielding. Magnetic flux concentration and accurate control of the power distribution by using Faraday rings are very problematic and require significant power adjustment. Use of magnetic flux controllers, made of soft magnetic materials (steel laminations, ferrites and magnetic composites), is addressed in this paper. Application of magnetic controllers can increase field intensity in required areas (field concentration), change field distribution, shield certain areas from unintended heating and strongly reduce magnetic field in external space. Typically several effects are being achieved simultaneously and a reasonable compromise must be found in the process of design. In some cases it is difficult or even impossible to meet specifications of heating without application of magnetic controllers. Effects of using magnetic controllers, design guidelines and results prediction with the help of computer simulation are described in multiple publications [1-3]. This presentation is focused on performance of materials used for magnetic flux control in different applications. Use of ferrites for magnetic flux control in induction systems is limited to high frequency applications (typically above 100 kHz) such as impeders for HF tube welding, inductors for sealing and plastic welding, small brazing coils, etc. Advantages of ferrites are: possibility to work at high frequencies (up to 13.56 MHz in some cases of induction heating), high permeability in weak fields, high electrical resistivity (not for all grades of ferrites) and chemical resistance. However they have low saturation flux density (below 0.3-0.4 T), low Curie point (typically below 200-250 °C with up to 350 °C for some types). Ferrites are sensitive to thermal shocks, brittle and very hard, which makes manufacturing the complex geometries by machining very challenging. Variety of induction coil designs is very big but quantity of the coils of any particular type is usually rather small and it isn’t economical to make “net shape” concentrators of optimal size and geometry. Designers of induction tooling try to use the standard shapes (plates, rods, C and E forms, etc.) and “adapt” the coil design to these limits. Of course there are some cases when a required number of controllers may be very big and it is effective to manufacture special net shape ferrites, e.g. ferrite rods for the impeders for high frequency tube welding. In traditional induction heating applications the use of ferrites is limited to relatively simple shape controllers for small high frequency induction coils. Laminations are the main material for low and middle frequencies (up to 30 kHz and even up to 50 kHz in some special cases). They are used for matching transformers (up to 20 kHz), shunts and cores for induction melting furnaces, forge heating furnaces, large heat treating coils. Advantages of laminations: very large components of simple geometry may be made (such as big furnace shunts which may reach a length of several meters), high saturation flux density (1.7 T), high permeability, low losses at low frequencies, high Curie point and good temperature resistance. The drawbacks of laminations are: bad performance in 3D magnetic fields, limited machinability, laborious assembling, frequency limits and complicated thermal management (cooling). Stamping and laser cutting simplify manufacturing of sheets but some manual cleaning of burr and other defects is still required. SMC is a class of materials that was significantly improved during the last two decades [2, 3]. SMCs are made from ferrous particles (iron or its alloys), covered with a thin insulation layer, mixed with organic or inorganic binder, pressed at high pressure (up to 720 MPa and even higher) and cured or sintered. Majority of SMC that are being used in induction industry has organic binder, which provides good machinability. Long term experience in induction business shows that mechanical properties are very important for the magnetic flux controlling materials. Possibility to work in 3D fields and good machinability are highly valued by the induction coil manufacturers. Different types of SMC can work in the whole range of frequencies used in induction heating (50 Hz-13.56 MHz). Losses of SMC at low frequency may be comparable to losses in laminations and at high frequencies – to losses in ferrites. Temperature resistance is lower than for laminations but usually sufficient for induction applications. High thermal conductivity (up to 0.2 W/cmK) and possibility of effective thermal management using external or internal cooling can keep the controllers safe in heavy loaded cases . The drawbacks of SMC are limited dimensions (up to 220 mm long plates at present time) and higher price than for laminations. However with account for labour cost and possible improvement in performance, use of SMC in many cases is cheaper than for laminations. Technical and economic analyses show that in some cases a combination of different materials will give excellent results. For example, laminations may be used for the regular part of controllers and SMC for areas with complex shape and 3D field, such as the end zones of seam annealing coils. SMCs are very versatile materials. Wide and always growing variety of applications sets new demands to the material properties [2, 4]. These applications include biomedical treatment, food packaging, electronic clean room processing, crystal growth, traditional heat treating, metals and non-metals melting, and many others. Typically the following groups of properties must be considered: mechanical, magnetic, electrical, thermal and chemical. For special applications the magnetostriction and acoustic properties may be also important. A significant number of SMC types are being used in industry. Three materials: Fluxtrol 100, Ferrotron 559H and Alphaform MF are selected for further description as representatives of different groups of SMCs [2, 3]. The first two materials are manufactured by pressing technology and the third one is formable. Some magnetic, thermal and mechanical properties of these materials are presented in Table 1. All pressed materials have certain anisotropy with lower thermal conductivity and permeability in direction of pressing. Magnetic and thermal properties in the table correspond to the favourable direction, i.e. for a plane perpendicular to direction of pressing. Anisotropy must be taken into account in design of induction coils and stock material orientation in the process of magnetic controller manufacturing. In spite of anisotropy all pressed materials work well in 3D fields. Formable materials are isotropic by nature; they aren’t pressed and machined. Instead they are made in the form of thick paste or clay, which must be applied to the coil and cured in situ. Fluxtrol 100 is a new material made of electrically insulated iron particles and organic binder. It is designed for a wide range of frequencies up to 50 kHz. This material has low anisotropy and good mechanical properties, which allows the users to machine parts with sharp corners and thin walls and use magnetic parts as structural components of the induction coil assembly. Magnetic properties of this material are presented in Fig. 1a and 1b. Initial and maximum permeabilities in direction of pressing are 58 and 85 compared to 80 and 130 in favourable direction. Thermal conductivity of the new material is 40 % higher than conductivity of the austenitic stainless steel 304, and its anisotropy is relatively small, only 20 %. Of course it is very important to provide good thermal contact between the controller and the coil copper using thermally conductive epoxy glue or paste. The improved heat extraction allows to reduce the rated temperature of material to 200-220 °C. Ferrotron 559H is a middle-to-high frequency material with organic binder. It has more binder by volume and therefore its permeability and thermal conductivity are lower. The binder works as lubricant in machining and the material has excellent machinability. Because of low thermal conductivity Ferrotron does not tolerate high thermal loadings. This material is designed for high frequencies and its electrical resistivity is very high allowing to consider it a “bad” dielectric rather than metallic composite. Alphaform materials are manufactured from the mixture of magnetic particles of different dimensions for “low” (LF), “middle” (MF) and “high” frequencies (HF). They are mixed with a special thermoset epoxy. Material is supplied to users in tin boxes, which must be kept at low temperature (better in refrigerator) for longer shelf life. When slightly warmed (to 35-50 °C), the material becomes soft and may be manually formed/shaped and applied to the coil turns. Then the coil with concentrator must be gradually heated for curing. During heating the material passes through the transient stage where it becomes thin and may flow out, requiring special coating or wrapping to hold it in place where necessary. Alphaform materials may be effectively used on ID induction coils and wrapped tubing coils of complex or irregular geometries due to its flexibility during forming. When cured, it becomes hard and then the concentrator shape may be corrected by means of hand-held tools. Material sticks to copper tubing resulting in good mechanical integrity of the coil and very good thermal contact even for non-machined coils with significant tolerances. Due to its properties this SMC is great for lab and development projects where immediate results are needed. Some properties of selected SMCs require additional consideration. Magnetic permeability is the primary property that characterizes magnetic materials. Selected SMCs have much lower permeability than laminations or ferrites, which creates doubts about performance of these composites. Multiple practical tests showed that for majority of induction systems permeability of 20-40 is sufficient for good performance of magnetic controllers . It is because almost all induction systems have open magnetic circuit and above a certain limit the value of permeability ceases to influence the system parameters. Major improvements take place when permeability increases from 1 to approximately 10. Further increase in permeability causes lower effects and improvements disappear at permeability higher than 30-50 depending on particular case. Moreover, computer simulation shows that when permeability of C-shaped concentrator is too high, there is no improvement in the power concentration, coil efficiency and power factor, while power density concentration in the corners of the coil tubing grows. It leads to local overheating of copper and formation of cracks due to thermal stresses. This effect was confirmed in crankshaft hardening when switching from laminations to Fluxtrol material significantly extended the copper life time . The above evaluations of the permeability influence were made for the service conditions. Under heavy loading conditions which are typical for example for surface hardening at low frequencies (up to 3-5 kHz) the concentrator permeability must be still high enough. It means that low frequency materials must have high saturation flux density and their maximum permeability must be much higher than 40. In high frequency applications flux density is much lower and high maximum permeability isn’t necessary. In some high frequency applications such as induction welding of small diameter tubes, flux density in the impeder may be high, the ferrite core saturates and the process efficiency drops. Use of SMCs with high Bs can improve the situation. It is important to underline that SMCs are quasi-linear materials. Permeability of Ferrotron is almost constant in a wide range of the magnetic field strengths with initial and maximum permeabilities equal to 16 and 18. Linear properties are favourable for some induction processes because the linear magnetic controller does not generate higher harmonics in the coil voltage and current. Electrical resistivity and strength are two parameters important for SMCs. Electrical strength may be measured for HF materials only. Ferrotron 559H has break strength of around 100 V for a 1 mm thick plate at frequencies 100-400 kHz. For Alphaform MF it is app. 350-400 V. These values are very small for real dielectric materials but are sufficient for majority of induction heating applications and the live parts can touch the magnetic controllers. For example, Alphaform may be applied to bare turns of the coil without danger of short-circuiting. Fluxtrol 100 has much lower resistivity and there is a thermal, not electrical break in tests. Therefore the parts made of this material must not touch two live parts with a difference of potentials. Insulation coatings must be applied to the copper or insulation tape such as Kapton glued to the controller. Electrical resistivity of SMCs is a tricky parameter. In the process of material pressing or machining of the components there is always smearing of the surface, which creates an additional path for current to flow. Surface resistivity of smeared layer depends upon the material composition and structure, manufacturing process (grinding, milling, turning, saw cutting), tool quality and regime of operation. Its value can vary from several Ohms to several hundred Ohm. Removing of smeared layer by etching helps but does not give reliable results. Etching agent penetrates into the material pores and influences the electrical resistivity. Special technique for evaluation of volumetric resistivity has been developed and used for different materials. More information about resistivity of considered SMCs may be found in . Alphaform samples for measuring resistivity may be made with no surface smearing and traditional 4-point technique may be used. Ferrotron 559H and Alphaform have very high resistivity, exceeding 1 MOhm·cm. In induction applications it may be considered as infinitely high. For low and middle frequency materials including Fluxtrol 100, the situation is more complicated. Fluxtrol 100 has resistivity around 12 kOhm·cm. This level of resistivity is sufficient for keeping the induced eddy currents in the controller volume at a negligible level. However one needs to prevent application of external voltage to the concentrator body. In Alphaform all the iron particles are encapsulated in epoxy and the material is resistant to the environmental conditions of induction processes. Fluxtrol 100 and Ferrotron 559H are resistant to traditionally used quenchants except of a smeared surface layer where the iron particles may be exposed to atmosphere and the surface rusting can happen. Additional treatment of machined controllers can eliminate the problem. For traditional heat treating and brazing application it is sufficient to etch the parts in CrysCoat or similar agents. Etching removes smeared layer and loose particles and prepares the parts for additional treatments if it’s necessary. Teflon coating may be used to meet requirements of clean rooms, food packaging and other special applications. After etching the parts are coated by a thin layer of a special Teflon coating according to a patented DuPont technology. Coating penetrates into the porous material and forms a firm surface cohesion. Coating thickness may be 4-6 microns. This coating is FDA approved and is being used in packaging industry for many years. Alumina, zirconia or other ceramic coatings may be applied to both Fluxtrol 100 and Ferrotron 559H using traditional flame spray technique. Of course special attention must be paid to the process setup in order to prevent thermal damage of SMC. A consistent ceramic layer may be formed with excellent cohesion with the substrate (Fig. 2). Ceramic coating may be applied also to the whole assembly of induction coil. This coating can prevent wearing and electrical grounding of the coil in the case of occasional touch to the moving part in the process of heating. Other coatings such as electrostatic plastic powder coating may be used when required for less demanding applications. Impregnation may be successfully used to fill the material pores and prevent outgassing, improve chemical resistance and mechanical strength. Impregnation with anaerobic epoxy according to Henkel technology showed very good results. Depth of impregnation depends upon the material type. Impregnated pieces may be glued to each other or to copper. Thin impregnated parts of Ferrotron passed severe down-hole tests for oil and gas drilling application. Fluxtrol 100 and Ferrotron may be easily machined using sharp standard tools or coated carbide tools. Materials may be machined using various methods (drilling, milling, turning, grinding, saw cutting, etc.). It is recommended to use higher speed and slower feed than for machining soft steel. Multiple passes are recommended in machining of thin-wall parts. With some experience parts with wall thickness less than 1 mm may be produced by turning or milling (Fig. 3). Drilling must be made on a strong support (wooden or plastic block) to avoid chipping and pilot holes are required for making large bores. It is not necessary to use cooling or lubricating fluids. Threaded bores may be made directly in Fluxtrol or Ferrotron parts but for higher strength and multiple use it is better to install brass or stainless steel inserts. Ferrotron 559H has low coefficient of friction and it is recommended to use a small droplet of epoxy when installing inserts Flat parts may be produced by water jet cutting from disks or plates. Crankshafts were the first parts in mass production  hardened by induction using clam-shell inductors (1934-35). Heating was static, i.e. the crankshaft did not rotate in the process of heating. U-shaped induction coils have been introduced later (1940-42) by Elotherm company; in this case the crankshaft was rotating. Both types of inductors are still being used until today. In spite of almost 80 years of production history, there are new tasks (more complicated geometry and hardness pattern, reliability, lifetime, etc.) that require technology improvement. Main improvements are connected with innovative applications of magnetic controllers . In clam-shell inductors, thin plates of magnetic controllers made of SMC Fluxtrol 100 applied to the sides of the coil (Fig. 4). Magnetic plates are accurately positioned in place by pins and glued to the coil for effective heat transfer. They provide precise control of heat pattern and simultaneously improve the system parameters. Fig. 4b shows temperature distribution in the crankshaft at the end of heating cycle generated by program Flux2D. When there are no side plates (top half of picture), significant heating of the crankshaft web (side portions of the shaft) take place. This unintended heating results in energy waste and additional distortion of the part. Practical experience showed reliable performance of SMC shields. Flux controllers made of laminations are traditionally used on U-shaped crankshaft hardening coils in order to distribute power in such a way that results in required heat pattern, including the patterns that extend onto the fillet. U-shaped coils are much more loaded because the coils cover only a small part of the pin surface (Fig. 5). One of the drawbacks of such coils is insufficient lifetime due to copper cracking under the concentrators. It was found that replacement of laminations with SMC material led to a significant increase in the coil life and to a possibility of better heat pattern control. This application is very demanding and big attention must be paid to material selection and concentrator installation technique. High thermal conductivity of Fluxtrol 100 provides effective heat transfer between the coil copper and the concentrator. Fluxtrol concentrator is made of a set of blocks in order to minimize influence of difference in thermal expansion of the copper and concentrator. Another example of inductor with SMC controllers is presented in Fig. 6. This assembly contains 4 single-turn coils separated by Fluxtrol rings. These rings shield the coils, eliminating their mutual influence and improve treatment quality and efficiency. Internal Diameter (ID) inductors are widely used for brazing, curing, heat treating and other operations. Application of magnetic controllers is especially important for ID coils because magnetic flux must flow in closed loop around the turns through the narrow space inside the coil. For this reason the current demand for ID coils without core is high and their parameters (efficiency, power factor) are much lower than for the external coils. The core “magnetically” expands the area inside the inductor thus strongly reducing additional coil current required to push the magnetic flux around the turns (Fig. 7a). Results of computer simulation for one of typical ID heating cases are presented in Table 2. The part is a stainless steel tube with ID 55 mm and wall thickness 6.4 mm; inductor has ID 30 mm and, length 30 mm. Winding is made of 4 turns of square tubing 6.4 x 6.4 mm. Frequency is 15 kHz and power transferred into the part 10 kW . One can see that magnetic core reduced the coil current and reactive power more than 2 times with approximately the same coil voltage. Efficiency increased from 70 to 84 %. For smaller parts effects will be even higher. Both machined and moldable SMC materials may be effectively used for ID coils. Small ID coils are often made by bending copper tubing (Fig. 7b). This case is very favorable for using Alphaform. Moldable material fills the whole space inside the winding in spite of some irregularities in dimensions and provides excellent thermal contact to the copper. Machined induction coils are used for hardening larger parts such as automotive hubs (Fig. 7c). In this coil quenching fluid is supplied onto the part surface through the orifices both in copper and in machined concentrator made of Fluxtrol material. The main problem that can appear when SMC controller is not applied properly is its overheating. There might be three sources of heat: magnetic losses in the controller, convection and radiation from the heated part and, in some cases, heat transfer from the locally overheated coil copper. Temperature prediction of magnetic controllers is a complex task, which requires consideration of electromagnetic and thermal phenomena and material characteristics. When magnetic controllers are cooled by contact to the coil turns, coil temperature must be considered simultaneously with the concentrator. There are many cases when the concentrator fails due to too hot coil copper. 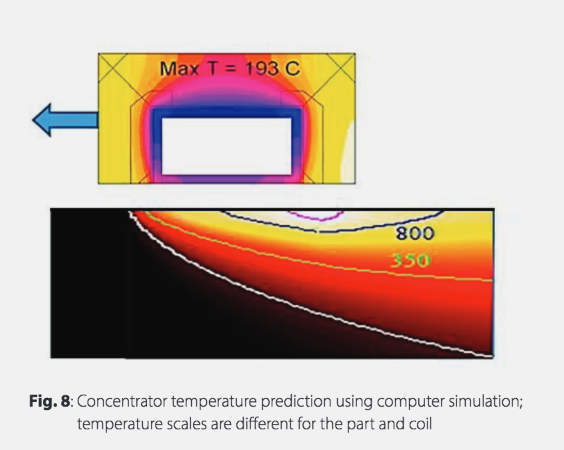 Computer simulation is the most accurate way to study and predict temperature distribution. Flux 2D program is a proven tool for this task . With some additional procedures the simulation can account for the magnetic losses and external heat sources, properties of material and glue as well as heat transfer from the copper wall to cooling water. An example of simulation is presented in Fig. 8. It shows a map of temperature in the coil copper and in the concentrator for a single-turn scanning inductor. Selection of the concentrator material and glue between the copper and concentrator plays a big role in temperature control. There are many methods of the concentrator temperature control. One of them is an internal cooling of material by means of water channels milled or drilled inside the concentrator. Theoretical studies and practical experience demonstrate that magnetic flux control is a very important component of optimal design of induction systems. Magnetic flux controllers can improve heat pattern, prevent unintended heating of the part, hardening machine or furnace structure, improve induction coil parameters and performance of the whole induction installation and shield the external space from strong magnetic fields. Soft magnetic composites can give new opportunities for induction system optimisation with account for magnetic flux control. They are very versatile materials and may be custom modified for special applications. Different types of SMC can cover the need in magnetic controllers for all range of frequencies used for induction heating (up to 13.56 MHz). One of the most valuable features of SMC with organic binder is their good machinability, which allows the users to make magnetic controllers of various shape and size. Additional treatment of SMC controllers (impregnation, coatings) expands their application to food packaging, electronic, etc. Computer simulation makes possible to forecast their effectiveness and optimize the heating process and coil design. It can predict also temperature distribution inside the controller and evaluate life time of the inductor.